Candidate/ Library lawsuit attorney Alan Geraci speaking Tuesday morning withhis clients Roy and Mary Garrett. Alan Geraci, a San Marcos attorney who is also the Democratic candidate for the 75th Assembly District, is representing two local residents in their lawsuit against the city council’s approval of outsourcing the Escondido Public Library to Maryland-based Library Systems & Services (LS&S.) The lawsuit was filed this week. 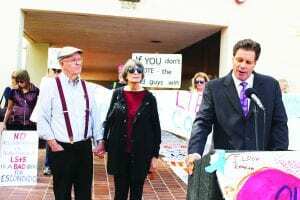 The announcement was made by the Save Our Escondido Library Coalition Tuesday morning at 11 a.m. About 50 members of the Coalition then walked the short distance from the Escondido Library to the City Clerk’s office in City Hall to serve the city papers filed previously in the Vista Courthouse. 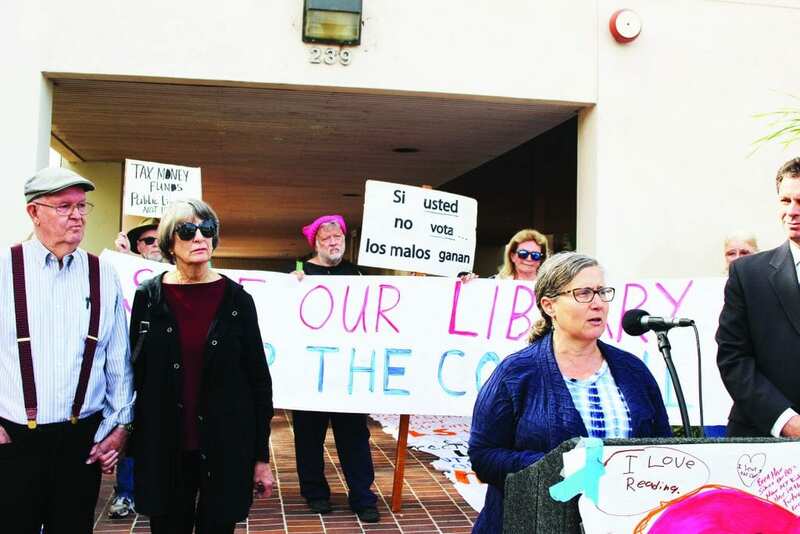 Geraci represents Roy and Mary Garrett, longtime Escondido residents, who claim the city violated the Ed Code in August when it approved of outsourcing the library to Library Systems & Services out of Maryland. 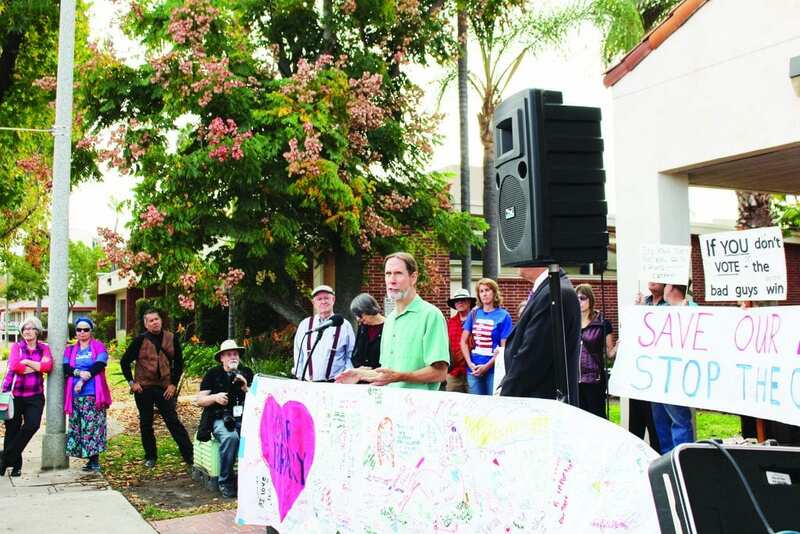 Before the march, Geraci introduced the Garretts, and Debbie Resler, president of the Save Our Escondido Library Coalition. 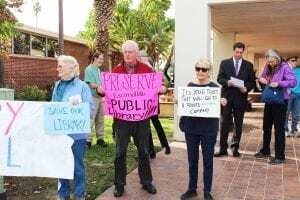 John Donel, senior librarian at the Escondido library, who recently submitted his resignation, effective December 2, also spoke. Geraci said the lawsuit “asks for a writ of mandamus [aka writ of mandate], which is an extraordinary remedy, and not like a regular lawsuit.” He said he would ask the city attorney to stay the execution of the council’s action until a judge can hear the case, and that if the city refuses, he will ask for an injunction. Library activists. In the background attorney Alan Geraci confers with Save Our Library Coalition Laura Hunter. October 18 the city council voted 4-1 to enter into a five-year contract with LS&S. The contract with LS&S was adopted by Mayor Sam Abed and Councilmembers Masson, Gallo, and Morasco, with Councilmember Olga Diaz voting no, after a long hearing on October 18. The library has more than 30 employees who will become private employees or be out of a job. 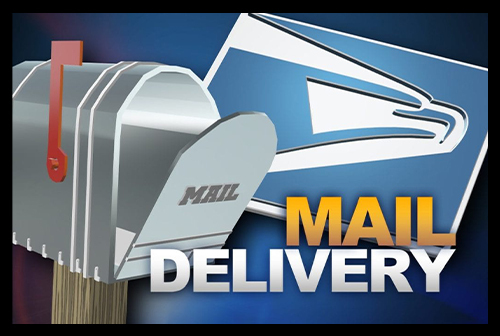 Geraci, who is running for Marie Waldron’s 75th Assembly District seat, learned about the issue when he was attending a meeting of the local Democratic club, where he signed a petition against it. Library activist exercising the age-old right to comment on local politics by connecting it to national politics. The concluding speaker was John Donel. “As a lifelong public employee who has always worked to meet the needs of the public, I cannot in good conscience continue to work for a city government that has dishonored what it means to be a public servant,” he said. 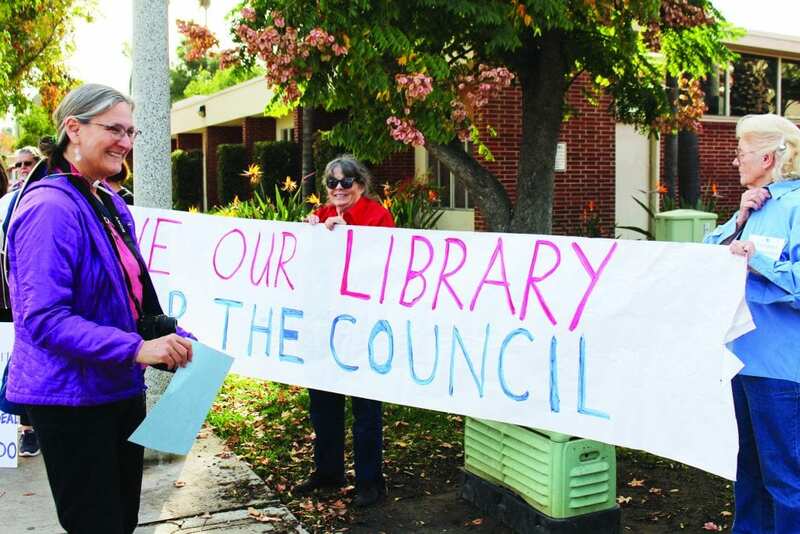 Several times during the run up to the October vote by the city, Roy Garrett admonished the council that it was violating the Municipal Library Act requirement of California Education Code § 18910, that its public library shall be managed by a board of library. Garrett has crossed swords with the city in court before. In 2006, he successfully challenged the city’s ban on renting to illegal immigrants. The city settled the case, essentially backing down. 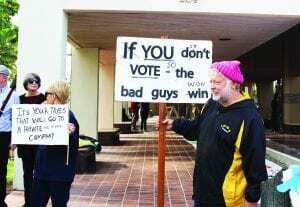 Members of the Save Our Escondido Library Coalition roll out a long handmade sign Tuesday morning shortly before the press conference. John Donel, senior librarian, Escondido Public Library, explains why he resigned from his position several weeks ago. Laura Hunter, one of the leaders of the Save Our Library Coalition, admiring one of the signs supporting the lawsuit.